Hf: John McLean contacted me about An Iodhlann the history centre on the island of Tiree the outermost of the Inner Hebrides off the west coast of Scotland, UK. John was interested in any Tiree mariners with a Hong Kong conection and wondered if I could help having seen my article on the Celestial, see article linked below. An Iodhlann publishes a newsletter Sil Eolais. John pointed me in the direction of an article in issue Number 24 November 2011 on “The Hongs of Tiree”. This links Tiree and HK island through the eventful life of John Lamont. HK island – 80 sq kms – population 1.3 million. Time to be twinned! It was one of those ‘An Iodhlann moments’ when your heart misses a beat. Hugh Lamont, the Ruaig postmaster who was born in 1886, was a ‘character’ still remembered on the island. His sloinneadh, or patronymic, was Eòghann Iain na Hongs – Hugh, the son of Iain of Hong Kong. 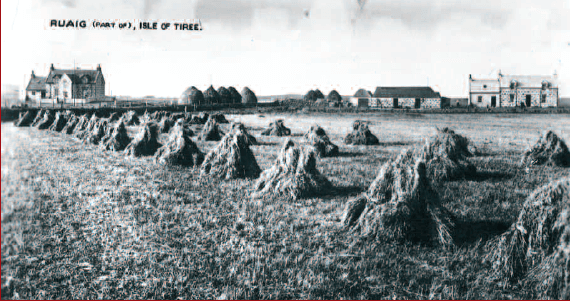 Post card of Ruaig from the 1930s. The house on the left is that of Hugh Lamont, Taigh Eòghainn Iain na Hongs, Ruaig post office at the time. The story was that an ancestor had made a fortune in Hong Kong, but no one on Tiree knew more than that. Then Duncan Grant got a call. Susan Lamont from Devon wondered if we had any information about her great grandfather, John Lamont, who had left Ruaig as a ship’s carpenter in the 1820s and built the first dock in Hong Kong, becoming a millionaire in the process. The European story of Hong Kong started in 1842. Following defeat in the First Opium War, the Chinese ceded Hong Kong Island to Britain. John Lamont was an early European settler who became one of the foremost entrepreneurs of the colony. Those involved in the repairing and building of ships formed a well-respected group of skilled men… Most prominent among them was John Lamont, a Scottish ships carpenter… who was set up by Jardine Matheson and Co. with his own slipway in East Point as early as 1843 [one year after the colony was formed], where the company’s barques and clippers could be looked after and repaired. Jardine Matheson had been founded by two Scots in 1832 and became one of the major ‘Hongs’ or foreign companies on the island. To the side [of Jardine’s Bazaar, one of the oldest shopping areas in Hong Kong] were more godowns [dockside warehouses] and the patent slipway and workshops of John Lamont, a resourceful, self-made Scottish shipwright who maintained the firm’s ships. He worked on his own account, often with a queue of ships awaiting attention, but still managed to build small vessels, including the first foreign ship to be constructed in Hong Kong, a schooner [in February 1843, the 80 ton Celeste]. In 1853 John Lamont also built Hong Kong’s first steamship, The Queen, a wooden boat of 137 tons, for Douglas Lapraik, a well-known local businessman. He had now reached the next stage in his business career. 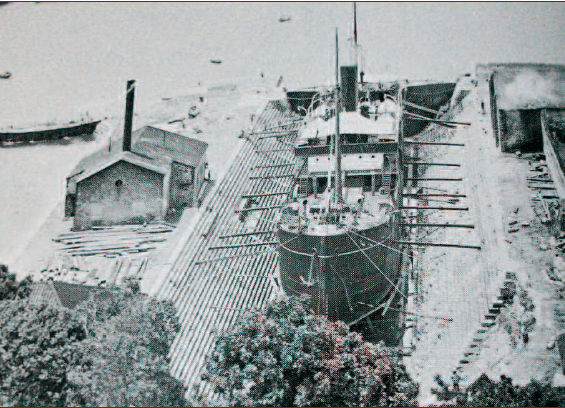 In 1859 he built Hong Kong’s first dry dock next to his shipyard in Aberdeen. Aberdeen is on the south side of Hong Kong Island, named after the British Secretary of State for War and the Colonies, the Earl of Aberdeen. Built by John Lamont, in the 1950s, the first dock was known as the Lamont Dock and proved highly successful. John Lamont described the facility himself. This dock, built of granite, has been in thorough working order for nearly two years. It is 335 feet long with a breadth inside the coping stone of 78 feet and depth of 22 feet. At spring tides the depth of water at the sill of the dock is 18 to 18 1/2 feet and at neap tides from 15 to 16 feet. Attached to the dock are engineering workshops with lathes of all sizes, planing, punching and shearing machines of the best description, a large foundry, saw mills with both vertical and circular saws, a powerful steam hammer, and every requisite and appliance for the repair of vessels both of wood and iron – the whole under the superintendence of European foreman. For particulars regarding docking and other charges, apply at East Point or at Aberdeen. John Lamont, Hong Kong, 10 April 1861. He was also something of an inventor, proposing the lining of docks with rubber which was then a new product in the Far East. Encouraged by the success of Lamont Dock, he went into a joint venture with Douglas Lapraik, planning a larger dock on neighbouring land. The British Government gave them a £3,000 grant, anxious to develop a facility in the Far East for its larger warships. But the prospect of large government contracts stimulated the interest of Hong Kong’s largest ship owners. Lamont added another dock to his enterprise, the Hope Dock, but before the latter was finished, both docks were bought,in 1865, by the large and very successful firm, the Hong Kong and Whampoa Dock Co. [an alliance of P&O, Jardine Matheson and Douglas Lapraik]. Hope Dock opened in 1867. On the 15th June, the new dock at Aberdeen belonging to the Hong Kong, Canton, and Whampoa Dock Company, was opened in the presence of the governor and a large party of invited guests. The dock is, of course constructed with the intention of accomodating either the ironclad Warrior or Black Prince (for draught of water), or the Pacific Mail Company’s steamer the Great Republic (for breadth of beam)…Under these circumstances, it would not be surprising if her Majesty’s huge ironclads be sent out to the China station, for the existence of this magnificent dock now opened in Aberdeen Bay, Hong Kong, removes what would otherwise be an insuperable objection to their presence – namely, the impossibility of dock repair in the event of an accident. Lamont also served in the Royal Hong Kong Regiment (the Volunteers), which was formed in 1854. Lamont had been born in Ruaig in 1804. His father, Archibald, was described on John’s death certificate as a ‘farmer’ or crofter. John had two brothers, Donald and Hugh, who between them had 8 children. We don’t know much about his early life, when he left Tiree or how he reached Hong Kong. He must have been at sea where the practical skills he would have learned from his father would have been useful. He arrived in Hong Kong in his middle thirties. The European population of the colony was still small and he became a well-known figure. Slim and bronzed, with humorous grey eyes, Lamont always wore at least one item of Scottish tartan, and spoke such broad Scot that no one understood him when he first arrived. He, like Douglas Lapraik, had settled in Hong Kong with a Chinese ‘Protected Woman’. He was also one of those rare men who were able to move in any society and seemed equally at home whoever he happened to be with…One must admire such a man who could overcome all obstacles, get on with everybody and create for himself a happy home life with his two young boys and their Chinese mother. Tiree Gaelic would have been his first language and he probably learnt most of his English as a young sailor, giving him a rich mixture of accents. He seems to have been proud of his Scottish identity. The Dress Act had prohibited the personal wearing of tartan in 1746. Although it was repealed in 1782, Lamont’s wearing of it was sending out a strong message. Europeans were strongly discouraged from marrying local girls, but Lamont settled down with Awa Moy, who had the status of a ‘Chinese Protected Woman.’ They had two sons – Charles, born in 1847, and Archibald, who was born in 1851. These were both baptised in 1852, possibly in a Chinese bowl still owned by the family. The boys were both sent to a small private school in Peebles, although their Tiree family believed they later went to Eton. It was said that they came once on holiday to Tiree to stay with their relations. They were not impressed with the food and never returned! His father wanted Archibald to become an apprentice shipbuilder at Halls of Aberdeen. However, the son changed course to become a student farmer in Torryburn, Fife. Both went on to settle in Scotland, marrying and having families. Archibald sadly died young at the age of 24. Lamont had sold his shipyard interests in 1865 and returned to Scotland. Whether this was a holiday or a move to be nearer his children we don’t know. He died in the Douglas Hotel, Aberdeen, Scotland, on 25 August 1866 at the age of 62. His death certificate records him as a Master Shipbuilder, and, poignantly, as single. The form lists his usual residence as Cathay House, Cullen, living with his son Archibald. Although he died in his native land, his death was marked in Hong Kong. When [John Lamont] died, the Governor himself proposed a toast to the memory of this once ‘common carpenter’ who partly with the firm’s support had made a large fortune. The Thistle and the Jade: a Celebration of 175 years of Jardine, Matheson and Co. ed. Maggie Keswick, Frances Lincoln, 2008. He had certainly done well in his adopted country. He left £1000 (the equivalent today of £80,000) to his eight Tiree nephews and nieces, and an allowance of £400 a year (the equivalent today of £30,000) to his sons until they reached the age of 30, when they received their full inheritance. Matheson was his executor. The docks were heavily bombed by the Japanese before their invasion of Hong Kong in 1941, but continued to operate until the 1950s. Twenty years later the docks were taken over again, this time by Hong Kong United Dockyards, who then moved their operations out to Tsing Yi. And in 1976 Alasdair was in charge of moving the remaining workforce from Lamont Dock out to the new base. Built by a Tiree man and closed down by another! In 1985 the area was redeveloped and the two docks now lie beneath the second largest private housing estate in Hong Kong. Thanks to Susan Lamont, Kathleen Kennedy, and to Alasdair MacArthur for this information. If there are any other family members out there, please get in touch. This article was first posted on 21st June 2014.